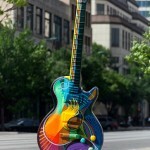 Where are the Gibson Guitartown Austin Art Guitars Now? 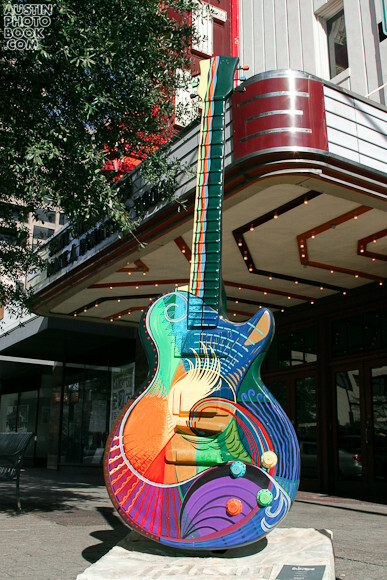 Like the recent “Play Me, I’m Yours” Street Piano art project, the beautiful custom guitars of the Guitartown Austin art project graced many popular public spaces around Austin for almost a year starting in November of 2006. 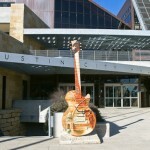 But like all good things, the Guitar Austin project came to an end in October of 2007, when the guitars were auctioned off in the name of charity, collectively raising over half a million dollars to benefit non profit organizations around Austin. If you want to enjoy the guitars today, you still can, but where can you find them? The Gibson website tells us where the guitars used to be, but nowhere online is there a single placethat that tells you where the guitars are today… until now! 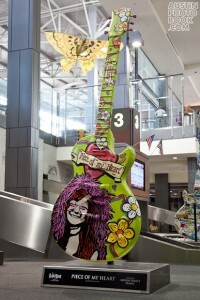 There are two public places where you can find the Austin the art guitars today: up and down Congress Avenue in downtown Austin, and in the baggage terminal in the Austin Bergstrom Airport. 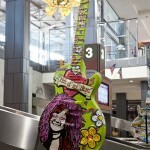 The real mother-load of Austin art guitars is inside the Austin Bergstrom International Airport in the Baggage terminal on the ground floor. 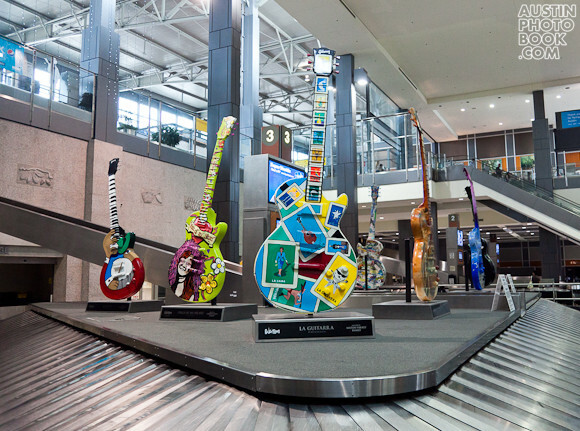 On baggage carousel #3 you will find at least SEVEN of the guitars sitting right next to each other. 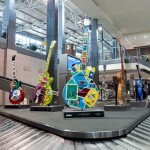 The next time you are downtown or going through the airport, make sure to check out these cool pieces of art! They are just one of the things that keeps Austin “weird” and a makes it a great place to live! Just a friendly reminder that everyone’s favorite Austin family event on 6th street is coming back on May 7th and 8th, 2011. 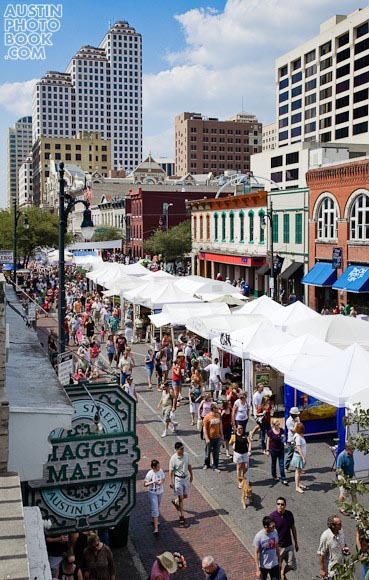 The Pecan Street Festival is full of live music, carnival style street food (think turkey legs, funnel cakes, alligator on a stick, and kettle corn), and many local artists showing off their wares. Going strong for 33 years, the Pecan Street Festival (which carries the old name for 6th Street) is an Austin tradition and institution. So, what’s good at the Pecan Street Festival? As far as the music goes, one of my favorite local bands, Brownout! will be playing on Sunday May 8th @ 6PM. They play drum and horn driven 70’s soul / breakbeat music with a Latin flare. Even if you aren’t familiar with Brownout!, know their alter ego, the popular Austin salsa / cumbia band Groupo Fantasma (most of guys are in both bands). Food wise, in addition to the tasty (and super greasy) treats I mentioned above, Austin food favorite Torchy’s tacos will be on hand as a solid option. It’s most likely going to be a hot Texas weekend during the festival, so make sure to bring plenty of water. I’m not much of a shopper myself, but there will also be plenty of stuff to buy at the festival, with over 100 vendors selling everything from arts and crafts, to jewelery, candles, clothes, and more. If you want to escape from the crowds, there are a couple of cool vantage points to take in the festival from. The photo above (which is in the book Austin, Texas: A Photographic Portrait) was taken from Maggie Mae’s rooftop patio, which is a nice breezy spot away from the busy streets below (if they are open). If you cant get into Maggie’s, the Iron Cactus upstairs patio is a nice place to people watch as the thousands of Austin festival goers pass by below. For more information on the Pecan Street Festival, visit their official site or follow them on Twitter @pecanstreetfest. 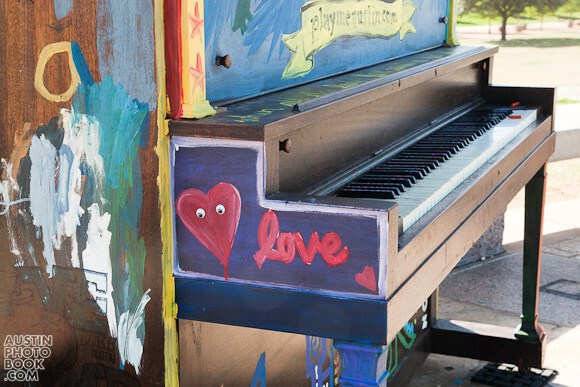 Colorfully painted, playable pianos have been popping up in popular public spots all around downtown Austin. Who do we have to thank for this infusion of cool in Austin, the Live Music Capital of the World? The Austin Art Alliance is sponsoring “Play Me, I’m Yours” a month long event that puts pianos in public places around Austin and encourages everyone to play. 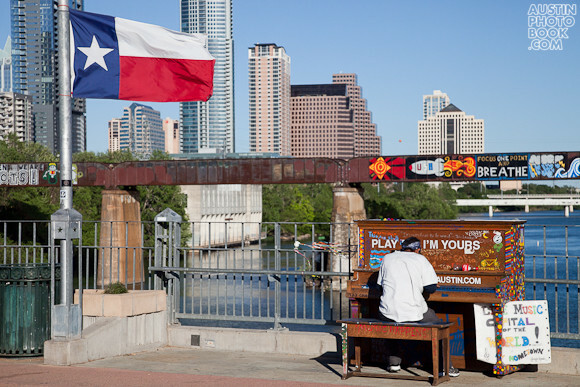 Austin is just one stop along the way of the Street Pianos tour, which has visited 17 cities since 2008. Next stops? Geneva, London, and San Juan! 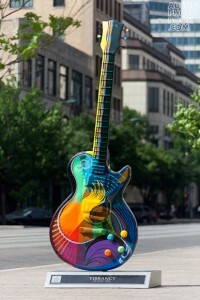 Those who have lived in Austin for a few years will remember a similar public art exhibition called Guitartown Austin, which placed huge, elaborately painted guitars in popular Austin places in 2007. 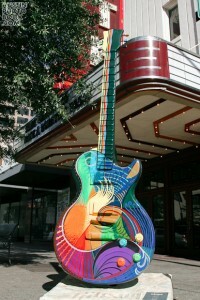 The art guitar in the photo on the left (which is featured in the coffee table photobook Austin, Texas: A Photographic Portrait), entitled “Vibrancy” was on exibit in front of the State theater back then and is still on display today on Congress Ave. 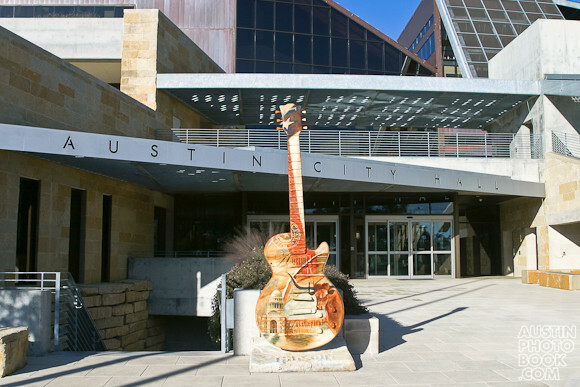 While Guitartown Austin was really cool, the “Play Me I’m Yours” tour brings more people together, as impromptu concerts have become the norm in places all around the world. 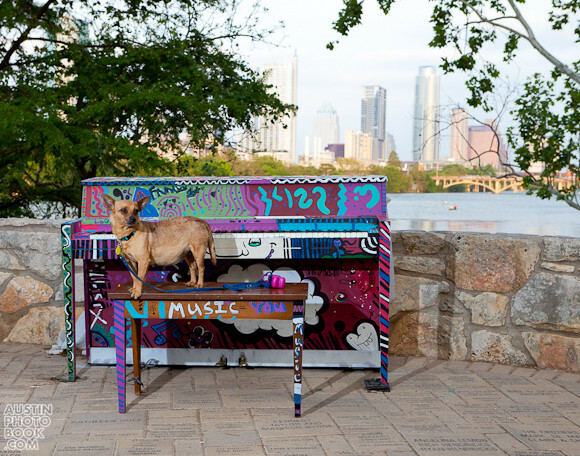 Lou Neff Point Street piano with a foster dog from Austin Pets Alive! For the next month at 14 locations around downtown Austin, don’t be suprised if you hear live music from a street piano. The art project runs only from April 1st – May 1st 2011 so if you want to be a part of this movement, you need to act soon. The photos in this blog post are courtesy of the photographer of the book Austin, Texas: A Photographic Portrait. 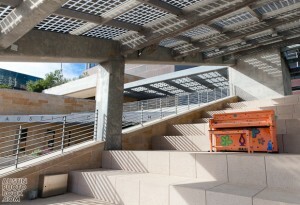 To see more Austin Street piano photos, go to his blog at www.petertsaiphotography.com. Also, to keep up to date with both The Art Alliance Austin and the Street Pianos movement, follow them on Twitter at @ArtAllianceATX and @streetpianos. 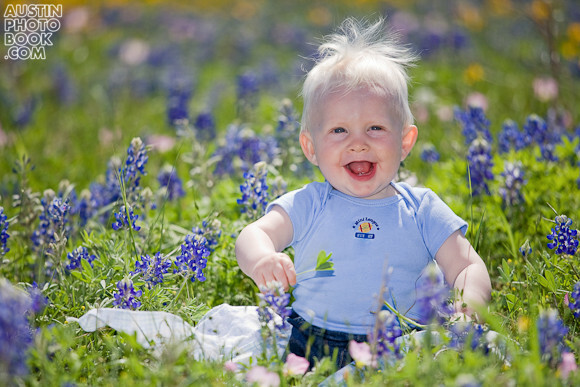 It’s April and Bluebonnet season in Austin is back, and soon everyone will want to take bluebonnet pictures in Austin! While the location of the bluebonnets varies year to year, there are a couple of sure ways to take a great bluebonnet picture in Austin. The first option is to head to the Lady Bird Johnson Wildflower Center in South Austin, where as their name suggests, they have large fields of bluebonnets throughout the gardens. The other surefire way to see bluebonnets is to plant them in your own yard! You can buy the seeds at your local nursery if you live in Texas, or you can buy Texas bluebonnet seeds online at Amazon.com. The other way to find bluebonnets is to scout out fields in public parks, school playgrounds, office parks, and alongside roads (not recommended!). The photo at the top of this post was taken in an open field near the Dell campus in Round Rock, Texas. There’s also often lots of patches up and down Interstate 35 (I-35) and Mopac (Loop 1). This year (2011) I have definitely seen medium sized patches bluebonnets along the sides of north Mopac, on Highway 79 in Round Rock, east of I-35 and also I’ve seen smaller patches in Zilker Park near the Frisbee golf range. In previous years, I’ve seen patches in the playgrounds of elementary schools, in people’s yards, and on college campuses such as Saint Edward’s University on South Congress. Seen any Bluebonnets this year in Austin? Let us know in the comments! Texas is well known for it’s BBQ and Austin has it’s fair share of BBQ joints. Perhaps none is more famous or more popular than the Salt Lick BBQ, just south of town in Driftwood, Texas. This place is always packed full of people on weekends, and there is usually a wait. However, most people view the wait as part of the experience. The Salt Lick is in a dry county, meaning that alcohol cannot be sold there. As a result customers at the Salt Lick BBQ are encouraged to bring their own beer (BYOB). 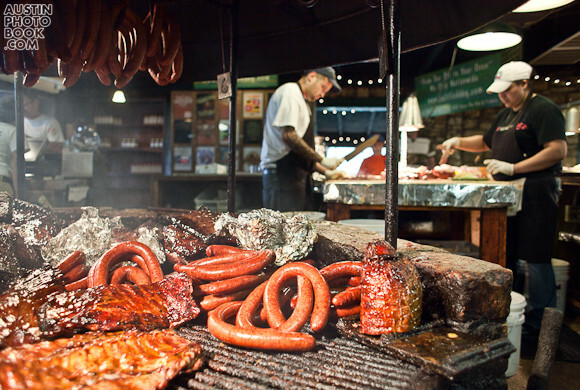 Cheap alcohol and a cool location inspires many to turn the Salt Lick experience into an all afternoon affair, drinking on the spacious outdoor patio area followed by stuffing their face full of all you can eat meats including pork sausage, beef brisket, and pork ribs. There are other dishes at the Salt Lick that aren’t on the all you can eat menu, such as BBQ turkey and pulled pork, but most people go for the never ending meat fest I described above. 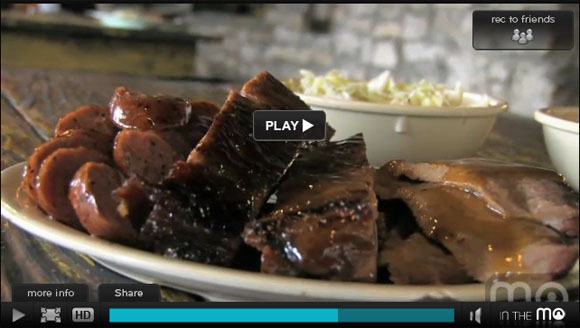 For the full story on The Salt Lick, check out this video below, which is courtesy of InTheMO, an online city guide website which I happen to be a featured contributer on! If you are in Austin for a while, head down to Driftwood for a fun afternoon, but go prepared to wait at least 30 mins to eat with a beer in hand. The Salt Lick does do have a north location at the Dell Diamond in Round Rock that doesn’t have a long wait, but the Driftwood location is the original location known for it’s atmosphere (and BYOB policy). Not a fan of crowds? if you are more into making your own BBQ, check out this article on how to cook a brisket on the Austin based TastingBuds Food Blog. Downtown Austin will be packed this weekend as 100,000 visitors cram their way into the Austin Convention Center for SXSW Interactive 2011, but you don’t have brave the crowds to have photo fun. This Sunday, March 13th, 2011, Peter will give a presentation on the Austin Photography Coffee Table book, Austin, Texas: A Photographic Portrait at the Austin Photography Group’s monthly meetup, which takes place at the Galaxy Dance Studios on South Lamar. His presentation will cover the ins and outs of publishing a photo book, covering legal aspects book publishing, challenges faced, and lessons learned. If you have ever thought of writing your own book or self publishing, this is a great event to attend, come with lots of questions ready! If not for Peter, come to the Austin Photo Group to network with other photographers and to share your work. At the end of each meeting, people share what they have been working on and talk about all things photo related.